HIGH PERFORMANCE POWER CHAIRS FOR ACTIVE INDIVIDUALS. VERY FAST (11+ MPH), OFF-ROAD AND BARIATRIC OPTIONS AVAILABLE. Power seating options include tilt, recline, 13" seat elevator, reverse tilt, legrests and front load (latitude). 6-drive programmable electronics standard; lights, horn, electric leg bag emptier and many other options available. Customization is our specialty. QuickTalker Freestyle is an iPad-based communication device that insurance can cover! Our streamlined funding process will benefit clients and speech language pathologists (SLP's) in getting their communication device quickly and efficiently. Let the power of QuickTalker Freestyle work for you! Able is the newspaper for, by and about the disabled. Since 1991 it has been bringing the disability community all the news that effects people with disabilities, their families and their caregivers. The newspaper covers national, state and local news and includes columns by experts in their fields, display and classified advertising and even a "personal" page that boasts two marriages. Accessible Dispatch gives New York City residents and visitors with disabilities greater access to wheelchair accessible taxis. Passengers can request an accessible taxi on-demand for pick-up anywhere in the five boroughs and pay the metered fare, with no extra fees. Visit www.accessibledispatch.com, call 646-599-9999 or 311 (NY Relay: 711), or download the "Accessible Dispatch NYC" app to book your next trip. Action Trackchairs and Trackstanders enable mobility-challenged people to pursue their passion of going outdoors to hunt, fish, hike, camp, and beachcomb. These awesome all-terrain TRACKED chairs bring hope for fun or work by providing a safe way to maneuver off the pavement. This is a 4 season, all-weather ride! Lovers of nature and the great outdoors, kids and adults alike, adventure's calling! LET'S ROLL! Offroad Trackchair LLC, your local Action Trackchair Dealer, will show you the way! ActiveAid, Inc. has been manufacturing quality medical equipment since 1965, specializing in the rehabilitation and emergency care fields. Advancing Opportunities provides services and support to individuals with disabilities and their families so they can lead fuller lives at work, home, school and play. Stop by Advancing Opportunities' Assistive Technology Pavilion. Our team of assistive technology specialists will be available for free hands-on demonstrations of the latest technology and tools. From low tech tips to advice about sophisticated software, we can help you find solutions. Visit us online at www.advoppps.org. Ali McManus: Singer/Songwriter/Motivational Speaker. In a wheelchair since the age of 7, Ali writes original songs that inspire with her message of resilience & positivity. Legendary producer Jack Douglas (Aerosmith, John Lennon) produced Ali's highly acclaimed debut album UNBREAKABLE. In her exuberant new music video, ROLL THIS WAY, Ali enjoins Steven Tyler (Aerosmith) along with skaters, dancers & friends to "roll your own way." Join Ali at her booth for music, videos, photo ops & autographs! For over twenty years, Altimate Medical has been leading the industry by creating unsurpassed standing technology for those with disabilities. Designed by a C6-7 quadriplegic, the EasyStand and Zing line of standing frames and equipment has helped to improve the quality of life for kids and adults using wheelchairs worldwide. AMP Fin™ Revolution The AMP Fin™ story starts with an unfortunate, life changing event that leads with a prosthetic fin company! MISSION STATEMENT Our mission is to provide both above and below knee amputees a high-performance custom fit swim and dive prosthetic fin, giving amputees the ability to reverse the effects caused by limb loss by building muscle, decreasing atrophy, increasing range of motion, improving gait, and strengthening residual limbs, leading to a more active lifestyle. AMRAMP helps people with limited mobility stay safely in their homes for as long as possible providing safe access in, out and around the home. Our national network of trained professionals are experts in designing the perfect accessibility solution for your home. We provide wheelchair ramps - RENT or Buy, Installed in Days, stair lifts, wheelchair lifts, patient lift systems, and portable showers. No permanent modifications to your home. Call for a free evaluation: 800-649-5215. Anderson Center for Autism (ACA) provides educational, residential, clinical, and support services to individuals on the autism spectrum, while optimizing their quality of life. ACA's core philosophy is that all people deserve to live a life of quality and ACA supports the individuals we serve in living the lives they choose. We are located in the Hudson Valley on a 100-acre campus approximately 2 hours north of New York City. Basic Home Infusion specializes in intrathecal pump management for those suffering from MS and/or spasticity. Basic Home Infusion is a highly specialized nation-wide implanted pump management & home infusion company. We have been providing top-end and cost-effective care since 1983. BHI is JCAHO accredited and compliant with USP 797 standards.The organization's unique business model allows for both national presence and comprehensive local coverage. The Mount'n Mover mounting systems by BlueSky Designs, provide versatile mounting solutions for iPads, tablets, phones, speech devices, laptops, cameras, eating/reading trays and more. Mounting systems are customizable and attach to wheelchairs, standers, walkers, tables or floor stands. Unique mounting features allows positioning of devices for optimal access and promote independence. Check out our mounting solutions for simple to complex needs. Do more with a mount that moves! Your wheelchair defines you to the world, Carbon Black is minimally designed from stunning yet understated carbon fibre so you're seen before your chair and your own style shines through - after all it is you that's important. Offering features never before seen in wheelchairs, Carbon Black is designed to out perform other lightweight wheelchairs on every level. Easy to push, easy to transfer, easy to live with, all of which means you feel and look great, empowered with confidence. We're making urinary catheterization safer, healthier, and more affordable for the millions of Americans who use intermittent catheters to empty their bladders who currently have a high risk of sustaining UTIs simply because catheters are really hard to use. By implementing a system that makes catheters safely reusable, we're able to offer individuals the same feature set as high-end premium catheters at a fraction of the cost and environmental waste. Clarke Healthcare is distributor for unique DME products from around the world.Dolomite walkers welded steel frames in 9 models, Legacy, Maxi and Jazz. The Aquatec and Major bathlifts. Ocean stainless steel shower commode chairs with recline, height adjustable or self propel. BORIS pediatric tilting shower chairs, Care Bags commode liners. CHCP distributes M-Rail and ArcoRail bed rail and Toilevator raised toilet platform. Portable ramps in fiberglass and aluminum. Rebekah Novemsky is the Family Mentor and representative from Community Access Unlimited. As a member of the staff at Community Access Unlimited, Rebekah is on hand to provide person-centered support services to all individuals with developmental disabilities and at-risk youth that we support. Rebekah is on-hand to work with families to help give them a voice to advocate for the services they need for their loved one to live an active and independent life in the community. Community Options' mission is to develop housing and employment supports for persons with disabilities. Community Options works with individuals with significant disabilities through residential services, day programs, social enterprises that employ individuals with disabilities, high school transition programs, and specialized programs for respite and medically fragile adults. Convaid | R82 develop and produce high-performance, easy-to-use and attractive innovative aids and appliances for special need children and young adults. Each product is custom-built and tailored to individual specifications to provide optimum comfort, safety and convenience based on comprehensive product development and clinical input. Together Convaid and R82 form the Etac Pediatric Group. The Courtney Bed is a specialized bed designed to keep your loved ones safe and secure while sleeping. A great alternative to a traditional enclosed hospital bed, the Courtney Bed is a beautiful piece of furniture. Our bed frame is hand-crafted from solid hardwood. The sidewalls are super flexible and easy to wash. Our bed is supplied with an 8" memory foam medical mattress and is FDA approved. Helping families, one bed at a time... let us help you too! Our Mission: Enhancing the lives of children and young adults with special needs and their families, by providing an enriched educational, therapeutic and supportive environment. Who We Are: CTC Academy is a 501 (c)(3) non-profit organization that provides educational and therapeutic services for students with a diverse array of developmental disabilities through our collaborative educational program and support services for students and families. The Richard West Assistive Technology Advocacy Center (ATAC) of Disability Rights New Jersey (DRNJ) serves as New Jersey's federally funded assistive technology project. ATAC of DRNJ provides assistance to persons with disabilities to obtain assistive technology devices and/or services. ATAC of DRNJ is funded by the U.S. Department of Health and Human Services, Center for Integrated Programs, through the NJ Department of Workforce Development, Division of Vocational Rehabilitation Services. We sell Ho'omana Oils, 3 topical, holistic, infused oils and a salve that help with pain management, helping with most issues. The all natural infused oils are handmade in Hawaii using native Hawaiian plants grown on the owner's farm on the Big Island. The formulas are centuries old, handed down through the generations, with the owner being the 10th generation. We offer free applications at our booth. Ho'omana Oil only has 7 distributors in the entire world, and only 4 on the Continental US. è Inspirante is an Adaptiave clothing line geared for comfort, as well as style, for Children and Adults. Skirts are designed for ease of putting on and off, while providing bright, fun fabrics to delight Children and Adults! Children's skirts are open in the back, while the Adult Skirts go completely around the body, having a flat back for comfort when seated, with a decorative front. Most skirts are made of 100% cotton for easy care. For over 65 years, Easter Seals New Jersey has been the leading nonprofit provider of disability services in the state. The services and programs available are designed to help individuals living with disabilities and their families remove obstacles along the path toward equality, independence, and dignity. Services provided include day programs, health & wellness curriculum, camping and recreation, travel & respite, and employment. The Emergency Preparedness Info Booth is supported by the NYC Emergency Management & NJ Office of Emergency Management along with several local disability emergency preparedness partner organizations. Come find out how you have the ability to become a preparedness partner too ! MANUAL WHEELCHAIR SKILLS WORKSHOP The Empower SCI Workshop at the Expo will challenge you to master new skills in your manual wheelchair. Signup for some individual attention in 15 minute increments and work on: - Wheelies - Going up and down our simulated curbs - Trying the "Wheelie Planks" - Wheelchair Maintenance, and More... And don't forget to ask about Empower SCI's two week summer residential program at Stony Brook University for individuals with all levels of spinal cord injuries. EZ-ACCESS®, a division of Homecare Products, Inc., is the USA's leading manufacturer of home accessibility products, including aluminum modular wheelchair ramps, portable wheelchair ramps, vertical platform lifts, patient transfer systems, toilet incline lifts, and threshold ramps. Founded in 1984, EZ-ACCESS® continues to be a pioneer in the wheelchair ramp market and has since expanded our signature products to include a comprehensive set of solutions for home accessibility. Feeling Snug As A Bug! Free Wheelchair Mission is a humanitarian, faith-based, nonprofit that manufactures low-cost, durable wheelchairs for those living with a disability in developing nations. In collaboration with a network of like-minded partners, Free Wheelchair Mission has provided more than one million wheelchairs to those in need in 93 countries around the world, providing renewed dignity, independence, and hope through the gift of mobility, at no cost to the recipient. Fun Truck'n Mobility is a wheelchair accessible van sales, rental and service company serving the Tri-State area. We have been in business for over 35 years, are family owned and operated. We specialize in the sale of conversion vans for wheelchair accessible use and sales and installation of all types of adaptive driving equipment for vehicles. Wheelchair Getaways is the leading wheelchair van rental company with a low cost solution to your accessible transportation needs. The GMS product line enables physically-challenged individuals to bathe & toilet conveniently, comfortably & safely at home or wherever they'd like to go, whenever they want to go. When you want, or have to travel, you may easily fold, pack 'n tow the GO-Anywhere Chair away in its wheeled carrying case. Constructed of anodized, lightweight aluminum, the GO-Anywhere Chairs are safe, durable, easy to use, comfortable and maintenance free. We ship worldwide; customer service is second to none! Green Mountain Support Services is a specialized, privet nonprofit agency in Morrisville Vermont. Our programs include development tal services, Brain Injury Program, Adult Family Care program, and supportive employment. Although located in Morrisville our agency serves the entire state. We also host the Vermont Cerebral Palsy Confrence. Which will be held October 5th at the Stowe flake resort in Stowe Vermont. Please contact Green Mountain Support Services for tickets. At Hands of Hope Physical Therapy and Wellness, our pride is upheld by our team of innovative and diverse individuals, who are united in their desire to provide top quality, compassionate health care. We offer unique services such as aqua therapy, in depth manual therapy with essential oils, vestibular rehab, stroke recovery, and pelvic floor rehab. Turning your hope into permanent recovery, our specialties as well as our unique practitioners provide you with a PT experience unlike any other. The Henry Viscardi School is an accredited model school that offers parents of children with severe physical disabilities a traditional educational setting that provides rigorous academics and opportunities for personal growth and leadership development. It's specialized, accessible educational setting provides a fully-enriched academic program, a variety of therapies, assistive technology and medical supports. HMS School specializes in working with children and young adults through age 21 who have complex, multiple disabilities resulting from cerebral palsy, traumatic brain injury or other neurological impairment. As experts in the field, HMS provides specialized education and therapy programs for day and residential students that maximize achievement and promote independence. HMS is licensed by the PA DOE/Bureau of Special Education with residential licensing by PA Dept. of Public Welfare. We sell an aloe vera skin care line with organic aloe. Nut and paraben free. Invacare Corporation (NYSE:IVC) is the global leader in the manufacture and distribution of innovative home and long-term care medical products that promote recovery and active lifestyles. Stop by to see the latest in seating, power and manual wheelchairs, or take an Invacare Top End handcycle for a spin on the handcycle track. For more information, visit Invacare's website at www.invacare.com. KayserBetten offers a wide range of enclosed beds to meet specific; medical, physical and behavioral requirements. With high rails, low thresholds, functional designs and wooden rods that create a superior environment, a KayserBetten bed may be just what you've been looking for. We offer help with product selection and assist you in the process to submit to your insurance or Medicaid. KayserBetten has over 30 years of manufacturing experience and all beds sold are registered with the FDA. 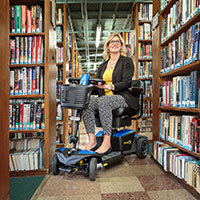 KEMPF adapts vehicles for drivers with a disability. DARIOS, the digital accelerator ring allows a driver without the use of both legs to drive keeping both hands on the wheel. The system appears to be a part of the original equipment of the vehicle. The steering wheel can still be tilted and all airbags remain functional. KEMPF features nationwide free at-home pick-up and delivery and a lifetime warranty with at-home service. All KEMPF products are VA accepted. Visit us at: www.kempf-usa.com. Kessler Foundation is a nonprofit organization dedicated to improving the lives of people with physical & cognitive disabilities caused by stroke, multiple sclerosis, injuries to the brain & spinal cord, & other chronic conditions. Kessler Foundation improves the quality of life for people with physical & cognitive disabilities through rehabilitation research. We are interested in getting the word out about our research, & how people with disabilities & their family members can get involved! Lakeview School is a private, non-profit school for students with multiple disabilities ages 3 through 21. Approved by the New Jersey Department of Education and accredited through the Middle States Association of Elementary and Secondary Schools, Lakeview offers students a full array of services designed to address their specific educational, medical, therapeutic and developmental needs. Lakeview currently provides placements and services to 60 sending school districts throughout New Jersey. The National Library Service for the Blind and Physically Handicapped (NLS), Library of Congress, administers a free national library program that provides braille and recorded materials to people who cannot see or handle print materials through a network of libraries across the United States and to American citizens living abroad. A HANDS-FREE SOLUTION for washing & exfoliating the entire back. Available in 3 sizes-easily installs in a shower wall & is machine washable. Refills available. Luffoliate is 100% Organic Natural Luffa. Luffoliate's interchangeable Luffa pads can easily be removed for machine washing/drying. Benefits all with shoulder pain, arthritis, people who depend on others to assist in bathing, the elderly & the disabled. For once, you can reach the hard to reach places & never neglect your back again! We believe that the odds are high of there being people in neighboring towns around you that have a similar diagnosis and need friends as well. That is the main reason why I am creating an Apple iOS mobile application that enables individuals with special needs, ages 13+, make friends. It matches people based upon their geographic location, diagnosis, age and interests. The application will be very user friendly and will work like a game. Manning Law, APC is a full-service disability rights law firm. We represent persons with disabilities seeking full and equal access to a wide range of public accommodations including restaurants, retail stores, hotels and the websites, mobile applications, kiosks and other services offered in connection with these venues. Matheny : What can we do for YOU!!! Learn about the wide range of services that we provide to people within communities across New Jersey. Our hands on interactive booth will include multi-media presentations, give-aways, product demonstrations and invaluable advice from a wide range of professionals. We hope that you can visit our booth, but if you miss us at Abilities, please feel free to contact us at dandreoni@matheny.org for more information. The MOTOmed family* supports people, who need Therapeutic help in their movement by an individual manner. The daily life in rehabilitation as well as the daily movement at home. The model-diversity, the large selection of MOTOmed accessories and different therapy programs allow an optimal adaption to the individual needs. All MOTOmed movement therapy devices have many safety functions like the spasm detection and spasm easing. safe movement therapy with physical handicaps is possible. Mercedes-Benz Vans are ready to build your business. The all new Metris WAV delivers large-van capabilities in a mid-size van for businesses and individuals requiring the space and flexibility only Metris can deliver. In collaboration with our MasterSolutions™ partner, TransitWorks, Mercedes-Benz Accessible Mobility™ now offers an efficient, ADA compliant, multi-function vehicle that is perfect for trasporting wheelchair passengers and able-bodied riders. Mercedes-Benz Vans. Born to Run. Midland is a not-for-profit 501 (c) (3) organization comprised of The Midland School and Midland Adult Services (MAS). Midland, in North Branch is a NJDOE approved private special education school dedicated to the individual, academic, social, emotional and career education needs of students ages 3 through 21, with intellectual and developmental disabilities. The Midland School promotes personal achievement and fosters independence through a diverse range of innovative programs and services. LIFTKAR PT is a portable solution to help you with indoor and outdoor stairs. The LIFTKAR PT gives you the freedom to enjoy your life; you can visit family, friends and do so much more. It is a battery powered, attendant operated Stair Climber requiring NO HOME or BUSINESS MODIFICATIONS! It works on Angled, Curved or Spiral Stairs of any stair material-carpet, wood, steel, concrete. It disassembles into 3 parts and is lightweight and easy to take in the car, plane or RV. ATTO - the smartest high-performance mobility scooter - while the compact folded unit splits in 2 for easier transport, ATTO comes together to form a robust full-sized vehicle with the best balance and use of space. ATTO's beauty is in the details, with standard features like a built-in USB charging port, deck storage and adjustable seat heights. A head-turning piece of equipment for those who literally would not ride in anything else. ATTO is the mobility scooter that refuses to look like one. Ms. Wheelchair America is a non-profit organization that provides opportunities for woman who use wheelchairs to shine in their communities. Under the NJ Dept. of Human Services, the Division of Disability Services (DDS) serves as a single point of entry for people seeking disability related information. Certified Information and Referral Specialists are available to to provide information and to assist with navigating State and County Services available to residents of NJ. In addition to administering some community programs, DDS publishes and distributes New Jersey Resources, a comprehensive guide to services available. The New Jersey/Eastern Pennsylvania Therapeutic Recreation Association serves as an advocate for therapeutic recreation in order to promote the health and well-being of the public through service, education, research, and the development and enforcement of standards of professional practice. New Jersey Statewide Independent Living Council, Inc. The NJ Statewide Independent Living Council (SILC) is a federally- mandated, governor-appointed 17 member body tasked with maximizing opportunities for the state's citizens with disabilities through planning and advocacy. It promotes a philosophy of independent living including consumer control, self-determination, peer support and equal access as it works to expand leadership, empowerment, independence and productivity of people with disabilities. NJ TRANSIT provides accessible public transportation on its rail, light rail and bus service in New Jersey and parts of New York and Philadelphia. These services include accessible rail and light rail vehicles and stations, lift-equipped kneeling buses and reduced fare for people with disabilities. NJ TRANSIT also operates the ADA paratransit service, Access Link. For more information on how to apply for Access Link, please call 1.800.955.2321 or send an email to adaservices@njtransit.com. Nuprodx design and manufactures innovative bathroom equipment which increase the independence of seniors and folks of all ages with disabilities. Our multiCHAIR series bath and shower chairs are strong enough for everyday use and lightweight and portable for travel use everywhere. At our "Made In The USA" manufacturing in facility in Livermore, CA, we also do custom work. There are very few people we can't fit into our chairs, and few bathrooms our chairs won't fit into. Stop by the booth today! Papa & Barkley is an award-winning line of pain relief topicals, tinctures, and patches. We offer THC rich formulations for acute pain management and CBD rich formulations for chronic pain/inflammation. Our products were inspired by a son's mission to find a pain relief solution for his elderly father's debilitating back pain. Today, we are a team of caregivers, scientists, researchers, and designers with a common mission: to unlock the potential of the cannabis plant to improve people's lives. Patriot Mobility Inc. provides sales, service and installation on the following products: Stair Lifts - Vertical Platform Lifts (VPL)- Wheelchair Ramps - Ceiling Lifts - Patient Lifts - Power & Manual Wheelchairs, Scooters - DME products from leading manufactures - Pool Lifts. We offer Bathroom and Home Safety modifications. We're a Service Disabled Veteran Owned Small Business (SDVOSB) servicing New York, New Jersey & Florida. Plant People is where modern science meets ancient plant wisdom. Our practitioner-formulated products use organic hemp as well as herbs and botanicals of the highest quality. We are vegan, gluten free, cruelty-free, non-GMO and rooted in regenerative agriculture. Some of our press includes The New York Times, Vogue, and Forbes. Our mission is to heal and connect people and the planet through the power of plants. And to give back to the plants that heal us, we plant a tree for every product sold! Prime Engineering has steadily grown as the innovative designer of Standing Systems by listening to clients, parents and healthcare professionals,. We have been building standing systems since 1984 and have always remained altruistic to our goal. "Standing you the way nature intended! Come by the booth and experience the magic of KidWalk and see where true innovation lives! Push to Walk is a registered 501(c)3 nonprofit that provides information, resources and a specialized exercise program for people with neurological conditions and paralysis due to spinal cord injuries, brain injuries, stroke, MS, cerebral palsy, and other neurological conditions. Our individualized workouts help people regain strength, function, and independence leading to a higher quality of life. We are located in northern New Jersey and offer free evaluations to those who qualify. The Quaid R. Mobus Foundation is dedicated to providing support, assistance, information, education, resources and most of all hope to families afflicted with spinal cord injuries. Experience benefits of acupressure during a FREE 15 minute Seva Acupressure for Stress Release session with Regina Rosenthal, PT, MA, author of "The Heart of Healing." Local practitioners list provided. Seva Acupressure was developed by Soul Lightening International and was used at Ground Zero; with college students; military personnel; and at professional & community workshops for managing pain and stress. The REHAB PAVILION mission is to provide customers the very best medical equipment for children and adults that can better your health and safety. We offer the following products: Leggero Strollers for pediatric mobility. FEAL Ramps for home and auto and Smirthwaite pediatric products including Activity chairs and the Mobi lifter. The TRG Rep Group is available to assist you with your equipment needs. Visit our website at www.townsendrepgroup.com for more details. This car seat cover uses a unique sliding action that allows you to easily get in and out of the car. It installs quickly in virtually all vehicles, and all you do is sit on the edge of the seat, turn into the car, and sit back. It is as easy as 1,2,3. SEE AND BE SAFE® products are designed to facilitate Activities of Daily Living with a unique line of accessories. Hi Visibility accessories enhance visibility of DME users and encourage greater independent mobility when traveling.They attach to ramps/wheelchairs/ power chairs and walkers. ADL products like GRIP solutions and water bottles and improve daily activities relating to mobility. Tote bags for under and back of electric chairs. Ergonomic shower transfer systems and Roll-In shower chairs designed and engineered in New Zealand. The transfer systems alleviate heavy lifting and unnecessary transfers. They also eliminate slip hazards and costly bathroom remodeling while maintaining the privacy and dignity of the user. This unique system allows for the patient to toilet and bathe in one easy trip, utilizing only one transfer. Vision "Persons with SCI will receive the highest quality medical care possible. Health care providers will possess the awareness and knowledge of secondary medical complications associated with SCI to adequately recognize and properly treat these conditions." Mission "To improve the quality of life and increase longevity by identifying, intervening, and/or preventing the secondary medical disabilities of individuals with spinal cord injury"
Spinal Singularity designs and manufactures products to improve the quality of life for people living with Spinal Cord Injury and Disease (SCI/D). The company has developed an innovative, extended-use, smart catheter system that is currently being evaluated in a clinical study at sites across the USA. The Connected Catheter is designed to reduce catheter insertions and could put men with Chronic Urinary Retention back in control of their bladders. At Spry, it is our mission to make your everyday life healthier and more comfortable. Our products are designed using innovative technologies that are created to give you customized comfort and better solutions to improve your health. Whether you're looking for a comfortable support pillow or for splints and braces- Spry makes it more comfortable. The Standing Company is the custom manufacturer of the "SuperStand" Standing Wheelchair. The SuperStand allows someone who is normally confined to a seated position in a traditional wheelchair to STAND UP and stretch out with ease and safety, at any time, in any place. Make yourself stronger and healthier simply by taking a stand in the Superstand Standing Wheelchair. Free evals. Frequently insurance supported. Made in the USA. DON'T JUST SIT THERE. CALL 1-800-STANDING today..
Supracor's lightweight, washable Stimulite® honeycomb cushions and sleep surfaces provide Total Pressure Management®—pressure relief, reduced shearing and ventilation to control heat and moisture—the key to preventing and healing pressure sores. Naturally antibacterial, antifungal and allergen free, Supracor's sustainable products are made in America from eco-friendly materials. See our new Stimulite Classic, Contoured and SlimlineTM XS Cushions, Positioning Wedges and Tension Adjustable Back. TheraFit Rehab is an outpatient rehabilitation center specializing in the treatment of individuals with neurological conditions. We work one-on-one to develop an intervention suited to each individual, assisting him/her to achieve his/her highest level of functional independence. Translated from German, Thomashilfen means "Thomas Helps". We are a family-owned business based in Seattle, WA. Thomashilfen offers sales, service, fast delivery and technical support. Specializing in mattresses for Wheelchair users, Pain, Parkinson's, Alzheimer's and Pressure injuries. Also providing pediatric products with the highest quality for mobility-positioning and safety, including EASyS, EASyS Modular, ThevoTwist, Swifty , tRide and Car Seats with the only Swivel base in the US. We created the world's lightest wheelchair power add-on - UNAwheel Mini. It's ultralight (5.3 kg), powerful (speed-up to 16 km/h), user-friendly and even classy at the same time. It has the simplest connection mechanism ever: it only takes 10 sec and two simple moves to attach/detach the device. It fits most wheelchairs. Adapter for standard or active wheelchair comes with the item. UNAwheel Mini is the Batmobile of power assists. It's black, it's powerful and it has a hero in the driver's seat. The VeloChair is a personal mobility device that is revolutionizing self-powered independence. While other mobility devices are designed for a passive participant, the VeloChair is designed for light cardiovascular exercise, everyday functionality, and overall comfort. This innovative solution can be operated by users with a wide variety of mobility ranges, providing indoor and outdoor flexibility to those challenged with balance, strength, or walking. Outdoor activities accessible to everyone!! - Self propelling for a true sense of freedom and independence - Multi-use wheelchair: beach, hikes, mountains, countryside, parks, snow, etc. - Well built and will last longer - Light (31 pounds) and collapsible which makes it easy to transport in a car or even in an airplane - Very durable and easy to care for - Customizable with a large number of accessories for people with many types of disabilities - Comes in 4 sizes for children and adults. VMI is a leader in the manufacturing and distribution of wheelchair accessible vehicles through dealers worldwide. From minivans to our new SUV conversion, VMI continues to lead through innovation, stability, superior customer service and dedication to quality. Since 1996 Weighted Wearables has provided a high quality line of weighted adaptive products that facilitate proprioceptive feedback, increase postural stability and attention span, and organize arousal level for learning. Weight and pressure can be highly beneficial to some children and adults. These products are suited for children and adults with various sensory integrative needs in a wide range of sizes, colors and styles. Wheelchair88 is the sole manufacturer and distributor of the Foldawheel wheelchair. This wheelchair is the lightest power wheelchair in the world. Weighing approximately 45 pounds the Foldawheel folds up in less than 5 seconds. It can easily fit in the trunk of most any automobile. Please stop by the Wheelchair88 booth to test ride this great product and other state of the art wheelchairs that we will have on display.